Yes, I think I also would prefer the thornless one! Thanks to you, I will know more Phoenix trees' names when go there to visit my relatives. Hi Tatyana. Me too! I used to have a Palo Brea and it was very beautiful, but is sure did get some scratches from the thorns when I was not being careful. Hello! I came across your page while looking for information on how to care for our Palo Verde tree. You mention that pruning is important. Can you please advise on when the best time of year for pruning would be, and how much we should take off? Any input is greatly appreciated! Thank you so much for your comment. Palo Verde trees are best pruned in June, once they have finished flowering. As a rule, you should not remove more than 20% of a tree's branches a year. To do so, would put undo stress on the tree, leaving it susceptible to disease and other stresses. Hi Noelle! Thanks for replying. I was hoping to do it during the cooler months but we'll just have to get up really early one morning in June and beat the heat. Thank you for the good info! I have a DMPV in a bed with an almost-native grass meadow, a mix of blue grama & curly mesquite. If it's not irrigated will it be OK together? If your tree is newly planted in that area, it will need irrigation until it becomes established, which can take 1 – 2 years. Thereafter, it should be okay as long as you water it deeply 3 – 4 times during the summer. I was referring to your comment that PVs will decline if planted with grass. Is my combination OK? Both are pretty well established. The tree is at least 3 years old and doing well, and the area is primarily watered by rainwater runoff from the roof (passive rainwater capture system). I think you are right that it has gotten too much water. RIght now, you are doing the best thing by not watering it and letting the soil dry out. Don't add any fertilizer – that will stress your tree even more because it will stimulate to work hard to produce leaves when its roots aren't large enough to support them. 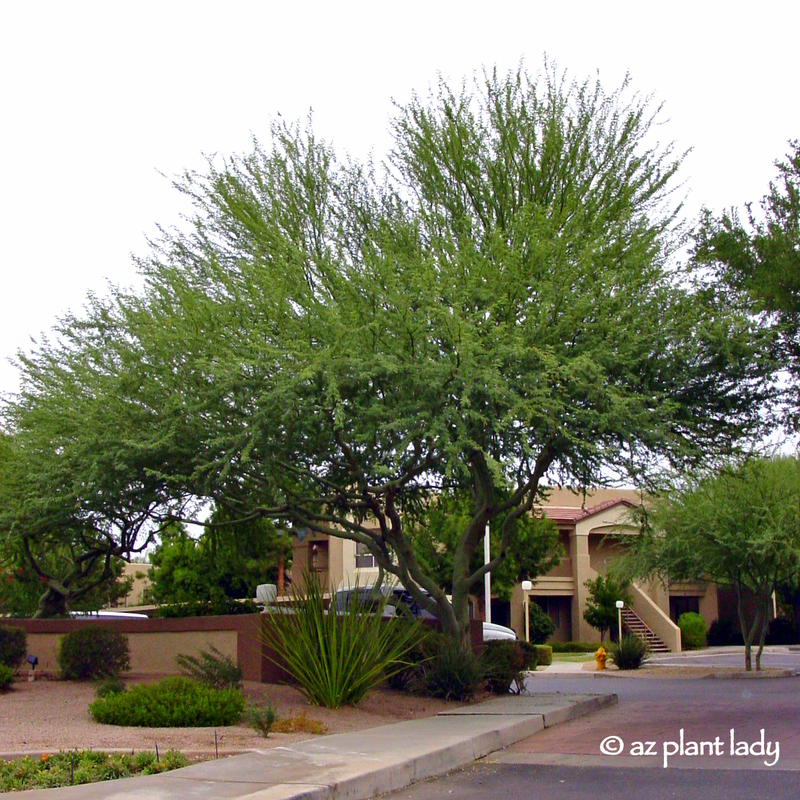 You won't need to fertilize your Palo Verde tree at all through its life. They are used to growing in our soils. For its first year, I would water it deeply (3 ft) every 10 days until November, when you can then back off to once every 15 – 20 days. Thanks for this resource! Quick question. I recety planted 3 DMPV 15 gallon trees. I swear the nuresry told me to give the tree a long watering that floods the 3 foot diameter little 'catch basin' on a daily basis.its day two and it seems a bit excessive. I already have a bit of yellowing on a few of the trees, but i assumed that was from a bit of shock from transplanting. How often, how long, and how much should i be watering them? Thanks. I am so glad you are growing Desert Museum Palo Verde trees. They are by far, my favorite desert tree. The nursery was correct in advising you to water your tree daily – I would do this for the first 4 days. Then you can gradually taper off to every other day for the next 4 days. Then you can go to 3 times a week. I suspect that the yellowing leaves is a sign of transplant shock. It is always hard when plants are first planted, especially in summer. Keep a close eye on your tree. You may need to adjust your watering schedule if the soil becomes water-logged. Hi Noelle! I too am glad I found your blog. I recently bought a vacation home in Lake Havasu City, AZ, and am so excited about the prospect of nurturing a desert garden. At the same token, I'm a little worried I'll destroy what has been established. There's a large PV in the front yard, the focal point of the garden. With infrequent summer visits, I am afraid the tree will die without manual irrigation, yet we haven't had time to establish a timed system. I've soaked the tree basin about once a month so far and as of last week, it looks pretty good. Should I worry? Thank you so much for your question. If your Palo Verde tree is established (over 3 – 4 years old). It will probably do fine with infrequent irrigation. If you have irrigation on plants that surround your tree – your tree will get some water from that. However, desert trees need deep, infrequent irrigation. When you water, you want to focus on applying the water where the branches end (where they reach out too). This is where most of the roots are located. Using a hose on a slow trickle, let it thoroughly soak the area for an hour or so and then move to the next area so that the entire outer circumference of the tree is watered. Water to a depth of 3 ft. You can test how deeply you are watering by using a piece of rebar and pushing it into the soil after watering to see how deep the water penetrates and if you need to apply more. Hello. I live in Scottsdale, AZ I have 3 large desert museums in my yard and they are very healthy. The lower branches are really starting to spread out and getting a little low over my pool and over my driveway. I am going to have them professionally pruned, but it's the beginning of September. I read that you recommend June for pruning. Will they be okay if pruned in early Sept? Actually, I just had to do the same thing to my new Palo Verde tree. You can prune it a little right now – but try to avoid pruning any more then you have too. In a given year, you should never prune more then 20% of a tree's branches. Thanks for sharing! I recently just planted the first pic of the desert tree in my yard. I love how the trunk and branches are green. It makes it look like there's moss which would give the year the illusion that you don't actually live in a dry desert wasteland 😉 I did just mulch my yard, will that hurt the tree? Too much mulch near the tree can cause problems. An inch of mulch will be fine over the root zone of the tree (the part underneath the tree canopy from the trunk out to the outer branches). Keep mulch at least 6" away from the trunk of the tree or else you can have problems with fungal infections of the trunk. I feel lucky to have found this page. My wife and I bought a 5 gallon palo verde on Sunday. My goal was to get it in the ground quickly. I planted it, unfortunately at 2 pm it was about 85 degrees. I included miraccle grow soil for trees and shrubs at the bottom and sides as well as with the soil it had in the planter. The hole I dug is roughly 3 ft deep. It was really hard to dig that hole as the ground is really hard here in AZ. I used water to help with the digging so the hole would be moist for planting. We watered that night, Monday and Tuesday at least 5 gallons of water each time. After reading some things on the internet I did not water it last night. The soil appears to still be damp. The leaves are turning yellow now but the yellow flowers are still blooming. We gave it a vitamin mixture in the water on Tuesday. My question is have we gave it too much water or not enough? Did we make a mistake with the vitamin additive? Is the soil we put it in ok? What can I do to ensure it survives? Please help, my wife will be devastated if we lose this tree. We planted one previously two years ago with no success, but I am certain it is because the dogs peed on it constantly. We are protecting this new tree so that they cannot go near it. I feel lucky to have found this page. My wife and I bought a 5 gallon palo verde tree on Sunday. My goal was to get it into the ground quickly so after digging the hole (4 hours) we planted it around 2 pm. It was about 90 degrees that day. The soil was hard to dig, so we also purchased a bag of miracle grow soil for trees and shrubs. We watered it that night, Monday night and Tusday the leaves had turned yellow so I purchased a vitamin mixture for the water and watered it Tuesday night. 5 gallons each night. after reading a few other things on the internet and did not water last night. The ground is still damp about two inches underneath the top soil. The leaves are almost all yellow and it appears as though it may not make it. Which would devistate my wife as she has always wanted a palo verde tree. Have we over watered? did the vitamin mixture make the shock worse? at this point what can I do to ensure it survives? You have asked some great questions. Palo verde trees are easy to grow, aren't fussy and don't need any special soil or vitamin mixture. All plants suffer transplant shock when planted. That and/or the condition of the tree when you bought it could be the reason that the leaves turned yellow. The leaves will fall, but should be quickly replaced by the tree. Trees should be watered to a depth of 2 – 3 feet. Here is a helpful timetable created by experts for watering new desert trees: Every day for the first week, twice a week through June, 2X a month July through October and once a month in winter. Next year, water 2X a month spring through fall and once a month in winter. As long as the branches stay green and leaves begin to grow back, your tree should be okay and recover. However, if you notice growing of the branches, then I would recommend starting over. Back in the Spring,I planted a 20 gallon palo verde, here in SoCal, a few miles from the Desert. It was sort of thin but already had some flowers when I bought it. I filled the hole with water when I planted it. One day weeks later I noticed that all the leaves were gone, such that I thought either they all fell off or something ate them. However upon close inspection I have seen neither bugs of any type nor honey-dew on the tree. I thought I had maybe been under-watering, so I started watering more, 2 or 3 times per week, and fertilized. In a week or so I noticed new foliage growth…for about a week, then suddenly AGAIN, all the leaves, GONE. This has happened twice now. Help? The first time you lost the leaves is most likely due to transplant shock. All plants go through a type of shock when being moved from one environment into another. Any jostling of the roots can increase the problem and can lead to leaf loss. The second time you lost the leaves was due to overwatering. Also, palo verde trees do not need fertilizer – they are adapted to growing in poor soils with low nutrients. I'm sorry to hear about your palo verde tree. The fact that it lost its leaves points to some sort of stress. Palo verde trees are known to lose their leaves during times of drought, however, there can be a host of other problems that are causing the brown spots, including insect damage. I advise you to enlist the services of a certified arborist in your area who can look closely at your affected tree as well as those that are just beginning to show signs. I am an arborist in Los Angeles and I have a client with a underperforming 'Desert Museum'. I was called to their house in November approx. 8 months after the tree was planted; a 48" box from a reputable local nursery. The leaves have turned from green to grey, and much of these grey leaves fail to fall off the tree. They said the tree was planted in the pit atop a mound of gravel and filled in with native soil. The gravel concerns me, as I would never recommend this practice. I told them to turn off all irrigation until March. We are now in March and the owner has stated that the tree has begun to sprout new leaves, but again, they are quickly turning grey. Do you have any clues as to the problem? Following the recommended watering schedule should help your client's 'Desert Museum'. I live in Southern California, Orange County. I just bought the 15 gallon Desert Museum Palo Verde. This is my first time planting this tree. It is July now so should I wait until October to plant it in the ground? Can I plant it close to my lawn area? Hw long can it stay in the 15 gallon pot? I live in Southern California, Orange County. I just bought a 15 gallon Desert Museum Palo Verde tree, this will be my 1st experience planting this tree. It is July now so can I wait until October to plant it in the ground? Can I plant it near my lawn area? How long can it stay in the 15 gallon pot? and should I prune the branches a few feet shorter? I just rescued one from the clearance aisle at a Big Box store. My zip is 92345. Should I keep in my garage until Spring or can I plant now? Will it need special frost protection this winter? You can go ahead and plant it now since fall is the best time for planting. Protect it from freezing temps through its first winter and enjoy this lovely tree. I planted a 5 gal. size Thornless Palo Verde several months ago. Some of the leaves are turning yellow. I planed a 2nd tree at the same time, and the leaves on that tree are maintaining the green color. It sounds like you can be having a problem with one of your trees being planted too deeply. Dirt often settles after planting, causing new plants to sink down slightly. Lightly scrape away the soil underneath the tree until you see tiny roots or the trunk begins to slowly flare out. Thank you for the great resource and all the helpful information! We live in Midland, TX and bought two 15-gallon Desert Museum Palo Verdes in December, getting them in the ground December 26th (on a very warm day). We noticed a few weeks ago that the bark of both trees had been chewed by (presumably) some rodent – one tree has lost bark entirely around the main trunk, and the other tree has lost it around most but not all of the main trunk. The trees had been green and leafy but are now shriveled and with brown leaves. Do you have any recommendations what we should do from here? Some have told us to simply cut the trees both down to the ground and let them spring back up (but this time with some rodent protection!). Is there any chance we can salvage both trees as they are? Or are they both completely goners? I suppose our inclination may be to cut them to the ground in hopes they'll bounce back nicely and with their trunks fully intact, since even if the trees survive as they are I imagine they'll have large, permanent scars where they have been chewed away, which would of course not be our preference; however, we are totally new to Palo Verdes and relatively new to desert xeriscaping so we welcome whatever advice you may have to offer. Thanks very much for your time and help! You will need to cut the tree that has been chewed all around back t the ground since it can't transport nutrients. Since you have two, I would get ahead and do the same with other one. The should great w back nicely and as they blow, select 3 main branches (stems) to allow them grow into the new tree and prune the rest away. You will enjoy your palo verde trees and I hope that your are able to keep the rodents at bay. My research on PVDM's landed me here on your cool site! 1. How messy are the flower and leaf droppings (broadly speaking)? 2. Since PVDM is a sterile hybrid, is there any pollen still? If so, is this pollen generally an allergen? Thank you for your question. I apologize for not addressing it sooner. Desert Museum Palo Verde trees are a rather clean tree other than in late spring/early summer when its dropping flowers cause a mess. From what I have heard from several experts, Desert Museum palo verdes don't cause allergies. Rather, trees with smaller pollen do. I am thinking of planting a Desert Museum Palo Verde but keeping it as a big bush because of the location: the "bush" will be situated at a corner of the property, about 4 ft away from cement block walls and intended to distract people from the "ugly" look of the block walls. However, I read from your previous comments that the DMPV should not be topped off. Is there a way to keep the plant small? I am thinking of planting a Desert Museum Palo Verde in a corner of the backyard, about 3 to 4 ft away from the block-wall fence. The intention is to distract people from the "ugly" look of the cement blocks, so I want to keep the DMPV bushy and low. However, you mentioned in earlier comments that the tree should not be topped off. How do I keep the tree small then? Please help. Thank you very much. Unfortunately, the Desert Museum Palo Verde is a poor choice for planting so close to the wall. They can grow 30 to 40 feet tall and wide and there is no way to keep it small without constant pruning, which is detrimental to the tree's health and appearance. I recommend selecting a large shrub that has been pruned into a tree to fill that area instead and screen out the ugly block wall. Is there anything you can suggest? I'm in usda zone 10b. The best advice I can give you is to visit your local nursery and look at large shrubs that have been pruned into trees. Make note of the ones that you like and research how large they become. You are looking at one that is approximately 10 ft. wide or smaller. If you want to plant a tree 4 ft. from your wall, your best bet is using a large shrub, whose roots are less likely to cause cracking or problems with the wall. I'm so glad that I found this site, and I hope that you can help us! We have a PV in the front yard that broke during a windstorm. The remaining portion couldn't be cut in a safe way, so it was cut back to a 3' stump and left to sprout (our HOA requires a tree there). Well, it's sprouting like crazy! So many sprouts and they're heavy–the tree looks like a shrub right now. How do we maintain the tree in a way that encourages healthy growth back into a tree (and not this crazy sprouting thing)? Many thanks for your advice! I would select 3 of the largest sprouts, making sure that they are evenly spaced around the trunk. Then prune off the others. Allow the three to remain and removing any new sprouts from the trunk. As the remaining sprouts grow, they will form new branches. Gradually, prune up the new branches on the three main branches as needed to create a tree shape. Thank you so much for your wonderful, informative, and practical blog. We are relatively new to the desert (Chandler, AZ) and one of our favorite things about our home is the beautiful DMPV that is the centerpiece of the front yard. The tree is boxed in on three sides – 12' from the front of the house, 10' from the driveway, and 8' from the sidewalk. The fourth side is unrestricted. For the past two years, I have been pruning as little as possible, only enough to keep it off of the roof of the house and car, providing clearance for pedestrians, and thinning out where branches are criss-crossing. The tree has two trunks over a foot in diameter and two smaller trunks about 4" in diameter. Each of the large trunks has four large branches that spread out nicely at about 5", creating the canopy. The smaller trunks grow out from the base of the tree at 60 degree angles and then level out over the sidewalk and driveway. Their branches do not provide any of the canopy. I have received unsolicited advice that the two smaller trunks should be cut off. Cutting off the smaller trunks would make the maintenance pruning marginally easier, but I don't want to risk injuring our tree. Would the tree benefit in any way by cutting off the smaller trunks? I planted a 5 gallon dmpv last week. I live in Southern California. I used a potting soil and mulch mix. Depth was the same as the 5 gallon pot and width was 1.5 of pot. The native soil is sandy. I watered the first 4 days. Today, which is 6 days from the day I planted it, I noticed some of the branches are brown and dry. Mainly the ones that are the highest. The plant is still flowing. The weather here has been in the mid 70s. Did I do something wrong? Welcome to Arizona! Your tree sounds beautiful and your descriptions were helpful. You can go ahead and prune off the smaller trunks, keeping the priority in keeping the 4 major branches. The guideline for how much to safely remove from a tree is to prune off NO more than 20% of a tree's branches/foliage in a given year. That should help you as you move forward in deciding on what you can keep and safely remove. When in doubt, I recommend that you entail the services of a certified arborist, who can help. If you need the name of someone in your area, just let me know and I can give you a referral. I am so glad your tree is doing well! I recommend the folks at Top Leaf – http://www.topleafaz.com They do my trees as well as my clients and I have been very happy with them. Thank you very much for your advice. Other than the smaller trunks, all I need to do is a little thinning to provide clearance for the sidewalk and house, so I'm not close to 20%. I just planted a 15 gallon desert museum in my backyard in Long Beach, CA. It came staked with a single bamboo stake in the center tightly wound with green tape. The local nursery said that they recommend that it remain staked until the branches are more substantial. Everywhere i have seen on the internet says that this makes for weaker branches. Any recommendations for the amount of time it should remain stakes or not staked at all? Thanks. Congratulations on your new tree. You will have many years of enjoyment. I live in Southern California and was planning to plant a 15 gal DMPV in our north-facing front yard, which gets full mid-day sun in the summer. However, with sun getting lower, I now realize that in the winter, the entire yard is in full shade! Will it be okay to still plant there? Thank you in advance for your advice. They do best when in full sun. I’m not sure how it will do in the shade through the winter months. I would go ahead and try it because if it works, it will add beauty to your outdoor space. I just bought a home with a Palo Verde Tree in the Back yard. The yard was a mess and the local gardener came and pulled out most of the plants and trimmed several branches from the tree. It looks much better, but he did not put anything on the trunk where he cut the lower branches off. Should something be put on the cuts? Great question! You don’t need to put anything on the cuts. Research has shown that tree cuts heal faster when nothing is put on them. I hope this helps! I live in San Bernardino County and recently planted a 15 gallon Desert Museum Palo Verde in my front yard. When I removed the plant from the nursery container the bottom half of the soil separated, from the remainder of the soil. The bottom half seemed to be all dead root. I went ahead and planted the Desert Museum and saturated the soil . About 1 week has past and now I have notice that the leaves are turning yellow and falling off . The soil is still damp . ( the area that I live in has expansive soil condition). Is the plant stress from the transplant ? and is it bad to have the roots in the soil that is damp? I have not watered the Desert Museum for over a week. I was worried when the soil fell apart that it could kill the plant. Should I leave the plant alone and let it get over the shock of the transplant? It is a common problem that people often report when planting a new Desert Museum palo verde. It is likely caused by the shock of being transplanted and losing some of its roots. It still should be watered. Here is a general guideline for watering newly planted desert trees: Twice a week through June, once a week July – September, twice a month October – November, once a month December – February, and twice a month, March – April. These are guidelines only and adjustments may need to be made. I live in the high desert in Palmdale, CA. I had two 15-gal.Desert Museum trees installed mid-summer last year. One of the trees still has green branches and trunk, but has not begun to leaf out just yet, so I’m a bit concerned about that. At the moment, the weather in my neighborhood is warm and sunny one day and cold and windy the next. Spring has not quite settled in. However, all but two lower branches on the other tree have turned brown as well as about half of the trunk itself from the top down. A couple of the lower branches still show a little green closer to the what’s left of the green portion of the trunk. This particular tree did seem to struggle somewhat after being transplanted, and things just got worse as time went on. Rather than replacing the tree, it was suggested that I promptly remove all brown branches and trunk and wait to see if what’s left of the remaining green branches and trunk come back. I would so appreciate your opinion of this strategy. I’m sorry to hear about your tree. Unfortunately, chances are that the one that is turning brown, will not survive. However, there is a chance that pruning away the brown areas will stimulate new growth on the green sections so your tree can survive. So in answer to your question, “yes” go ahead and prune away the brown section, but realize that it may not be enough to save the tree. Thank you so much. I did trim off the brown branches and trunk and I’m keeping my fingers crossed. You are the best! Oh, thank you for your kind words, Janet. Please let me know how it does. I live in West Sacramento and planted two 2 1/2 foot tall desert museums about two weeks ago. The trees had a bunch of white spots on them that looked sort of powdery. Some of the branches also had dark brown spots. The nursery said that this should not be a cause for concern. After about a week, I noticed that most of the tips of the smaller branches turned white and were very brittle so I pruned off this area (about 1/2 inch). I have also noticed a couple of spots with pink colored powdery like spots. This winter has been super rainy in California and the area I planted in was super saturated clay. I have not needed to water yet as the soil is still really wet to the touch and the pots they came in were also really wet. I dug out 2 times the pot size and amended with fur mulch. Are the problems i’m experiencing due to transplant shock? They barely have any leaves and it’s almost May. I haven’t heard about with or brown spots on Desert Museum palo verde trees. This could be due to the differences in our climate. It is normal for them to suffer from transplant shock. I would keep an eye on them for the next couple of months for a worsening of symptoms. Also, when I took it out of the 5 gallon pot, half of the root ball broke off into the hole. Will that damage the tree? I noticed today that alot of the small needle size branches are turning yellow/brown and falling off. Is that normal? Is it from over watering? I hear very from many other people who have had similar experiences to yours after planting. Often, the tiny leaves do turn yellow and die to transplant shock. If half the root ball fell off, that will make the stress from being transplanted more severe. For desert gardens, I recommend tapering off waterings to twice a week (once it has been in the ground for a week). In July, water once a week. In fall and next spring, water twice a month, and in winter, water monthly. After a year in the ground, water twice a month. While I am not an expert on watering trees in SoCal, the guidelines that I have provided, are for trees grown in the desert. Where you live, they may need even less. When watering, it is important to water to a depth of 3 feet. Even if your tree loses most of its leaves, don’t despair. Often the grow back. If you still have questions, you may want to contact a master gardener in your area. I hope this helps! We had a 15 gallon Desert Museum Palo Verde tree planted in February of 2006 in our front yard in North Central Phoenix. The tree was barely 6ft tall and we were unprepared for how fast the tree grew. It would have been more appropriately sized as a solo tree in the front yard. Not only was the tree gigantic it produced massive amounts of flowers several inches deep every day during the spring and into summer. It grew so tall the flowers went over our roof and into our pool creating a mess almost daily in the pool as well. To top it off last winter I noticed my concrete driveway 4 feet away developed large cracks and lifted up big sections making a dangerous walking situation. Then I noticed cracks developing in my garage floor that coinsided with the cracks in driveway. So before I lost my whole driveway and garage floor, I had the tree removed. I guess I would warn anyone planting a DMPV I would not plant close to any structure you don’t want eventually destroyed. I don’t know whether we contributed to its massive growth or that is normal for this type of tree. You have brought up a great point about choosing trees. It’s important to know how tall and wide it will reach at maturity. DMPV trees do get tall and wide quite quickly. If they receive too much water, they can outgrow their normal mature size. It’s also equally as important where to locate large trees, which should ideally be placed at least 10 feet from any buildings, walls, and sidewalks, if possible. I absolutely would encourage people to be sure to plant their trees a proper distance > 10ft from sidewalks, walls, or driveways. I purchased a property that already had a lovely Palo Verde shading my patio. 3.5 years later, my HOA most likely will be removing it. The tree is gorgeous, and has been growing like wildfire! The root system is raising the asphalt entrance to my carport, and I have a couple of large cracks in the carport concrete floor. It is probably just a matter of time, before it will cause havoc with the patio wall, or even the wall to the carport. I will surely miss the lovely tree, and the shade it provides. It certainly wasn’t given much thought when planted, and I will need to look into an appealing planting that won’t cause a similar problem. Any suggestions are welcome. I live in Southern AZ. Thanks so much….I will look them both up. I appreciate it! I live in southern California and we planted a 5 gallon PV a few years ago. It is doing very well – green and blooms yearly, it has grown to about 15 feet tall. Our problem is we must move the tree to another location in our yard as it is too close to our patio wall. What is the best way to transplant the tree without risk of killing it? Is there a specific time of the year to transplant? Are there any precautions we should take when moving? It can be difficult to transplant a tree, even under ideal conditions, but here are some guidelines. The best time to transplant is in winter. Water the tree well a few days before transplanting. When digging up the tree, keep as much of the soil around the roots as possible. The roots extend to where the branches end. After transplanting, create a temporary basin around the tree that extends to the drip line (where the branches end). Water deeply three times the first week, and then twice a week for the next three weeks before slowly weaning it back to its regular watering schedule. It’s normal for some leaves to yellow and fall due to the shock of transplanting. I hope this helps! I live in South Tx and have a 5 year Palo Verde tree.This year it is slow to bloom. It is late April and I see some yellow flowers and some green leaves returning, but I am worried because by now it should be in full bloom. I do not see any dead branches. We did have a abnormal cold winter and it snowed. We have not had snow in 20 years. Should I just be patient? It does sound like the palo verde tree was affected by the cold winter. Because of the unusual weather and the fact that it isn’t flowering as usual, means that the two are probably connected. As long as the leaves are growing back, it should be fine. Great questions. First, the leaves are falling because they are receiving too much water. I’ve never seen them grown in pots before and would advise against it. They grow too large and their roots will likely become encircled and root bound. The answer as to how much to water is difficult due to variable factors – weather, sun exposure, etc. I would talk to the nursery where you bought it and ask how often they watered it. I hope this helps! Thanks very much. I was not deep watering when I did water it. If I do get it in the ground ,do I need to Admend the soil? Do I need to wait until fall ? You should plant it now, which will help it through the summer as the soil is cooler. Don’t amend the soil, but dig the hole 3X as wide as the rootball, but no deeper than the root ball. I hope this helps! Hello. What causes the desert museum tree bark to start splitting? BTW – thx for all of your previous advice when you visited our home. I’ve notice my thinner palo verdes branches are starting sag and look more “willow like”. What could be causing this to happen? If your tree is in flower, the weight of the blooms causes the branches to droop, which is temporary. Once the flowers are gone, they should spring back up. If they aren’t in flower, it could be that the branch is too heavy, which can be remedied by pruning it back by 1/3 it’s length. Hope this helps! Desert Museum palo verde trees aren’t palo breas – those are another kind of palo verde with thorns. Desert Museum palo verde trees are a hybrid tree with three different palo verde trees as its parents. It is a great tree to use in the garden, but it does get big, so it’s important to all enough room for it to grow. Its average size is 30 feet wide and tall, so you want to plant it at least 10 feet away from a wall or your house. Because it is a desert tree, it can be planted in spring, summer, fall, or winter. In regards to a watering schedule, I will email you a page from one of my favorite desert gardening books, which has a good schedule to follow. Here is to many happy years enjoying the beauty and shade of this lovely tree! I have a DMPV which is 2-1/2 years old. It’s growing well, very leafy with tons of yellow flowers. I live in Manhattan Beach CA and the weather is temperate and mild most of the time. The trunk of the tree and two or three of the lower, but larger, branches are turning brown. I saw a very old and large Palo Verde at the South Bay Botanic Garden in Palos Verdes and it had a brown trunk. I thought perhaps this browning was natural but after reading various articles, it appears not to be. The only problem my tree has had is a mild attack of inch worms which we stopped by spraying with BT. The tree is planted in sandy soil on a slight incline. I have it pull back a bit and it has straightened up. I water it once per week. The leaves are bright green and healthy. You told Janet of Palmdale that her tree which was browning would probably die. Am I in the same situation? While it isn’t unusual for old palo verde trees to turn brown with age, it’s not normal for younger trees. So, the browning trunk does indicate some problems. It is hard to tell you what is wrong with your tree as the growing conditions and pests are different in California than in Arizona. I recommend that you talk to a certified arborist your area or nursery professional – they should be able to help you. I have a PVDM and one day it dropped all of its leaves and now branches are turning brown. Do you know if we have borers in Southern California? What do you think caused this? This tree has been in well-drained sandy loam for two years. The same thing happened to the PVDM before it and that one died. One-by-one all of the branches turned brown and died. I might have over-watered but it wouldn’t suddenly collapse like that, would it? I have Googled myself silly and I cannot get answers. It was beautiful in the spring. I’m sorry to hear about your Desert Museum tree. I’ve heard this happening several time in the Southern California area. I haven’t seen that happen in the desert climate. I recommend contacting a certified arborist in your area who may have some insight as to what is causing it. Over-watering could definitely be a factor. These are desert trees and do best with deep, infrequent watering. Thanks Noelle. Lovely photo of you btw. I just planted a new one that is by itself on a slope so I will water deeply and infrequently since there are no other plants around to worry about. Fingers crossed! Happy wishes for years of beauty with your new palo verde! I’m considering planting a PVDM in my front yard. I’ve seen a few of them out here in Riverside, CA. One in particular (not sure what variety) has more of a traditional tree shape, i.e., it has one main trunk that then sprouts branches, say, 5 feet from the ground. And yet, all the other PVDMs I’ve seen for sale tend to be multi-trunks, i.e., they tend to have two or three trunks branching out close to the ground in more of a V-shape. So, my question is: Can I shape a multi-trunk PVDM starter tree into a more traditional looking tree by pruning off its multi-trunks and favoring one main trunk? Or would this stress out a small starter tree too much? You can try to find a ‘standard’ ‘Desert Museum’ palo verde tree, which is one that has been trained with a single trunk. However, the reason that they are hard to find is that they are more susceptible to breakage in wind. Multi-trunk trees are more resilient as the overall weight of the tree is dispersed among several branches, so I do recommend that you get a multi-trunk form. I live in Long Beach CA & bought 2 desert museum trees 2 1/2 years ago, they were fairly large but not sure the gallon size, they were $100 each at a nursery. 1 died about 4 months ago, I tried everything to keep it alive with no luck. The 2nd looks like a bush, still with no trunk, but pretty green and few flowers throughout the year. Please tell me how to trim the tree to get a trunk, and how to get it to flower more. We water it once a week with a good soaking like the nursery told me to do. It’s in pretty good sun most of the day. Help. Thanks. I’m sorry to hear that you lost one of your Desert Museum palo verde trees. In regards to pruning it into more of a tree form, you want to concentrate on gradually lifting up the canopy (the upper part with all the leaves and branches) of the tree. To do this, remove the lower, smaller branches back to the trunk. You want to concentrate on keeping the 3 main trunks and remove any smaller branches that may grow on the lower third of the tree. As the tree grows taller, you will continue doing this, gradually lifting up the canopy (if desired) so that it begins at roughly halfway up the tree or a bit more. I hope this helps! Thank you Arizona Plant Lady for clarifying what I should do with my 1 remaining living Dessert Museum tree. Of course I have 1 more question, to take my 3-year-old tree that still looks like a bush with no trunk to 1 that looks like a tree, I understand that I now have to remove some of the lower smaller branches from the bottom, but can I do it this month, in December? Or do I have to wait till the Spring? Again, I appreciate your help, as I don’t want another tree that I love to die. If you live in a frost-free location, go ahead and do it now. Otherwise, wait until late winter/early spring once the danger of frost has passed. Hi, I have a volunteer palo verde(I think) in my yard. Not sure what kind it is. I don’t want to pull it out, but I don’t have much room for it. Is it possible to keep it small, or transplant to a big pot so it might stay smaller? Right now it’s just like a tall piece of grass with fernlike ends. Thanks! Thanks, that makes me sad. But I guess better when it’s small, rather than cutting it when it gets bigger.